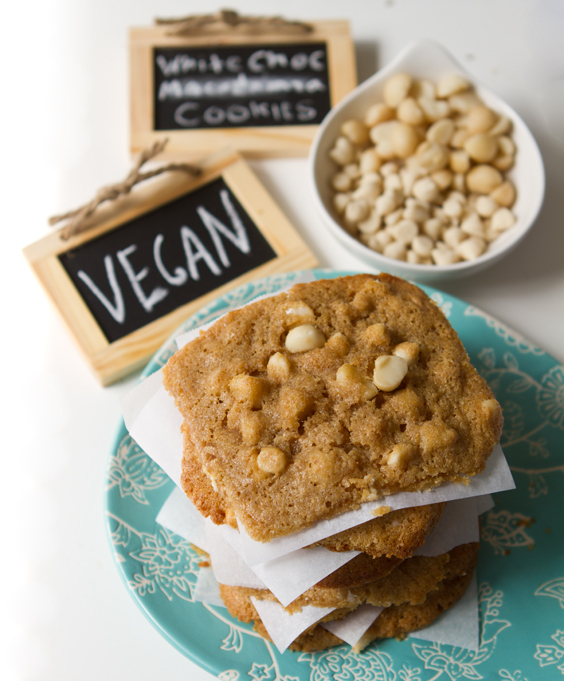 Vegan White Chocolate Macadamia Nut Cookies! 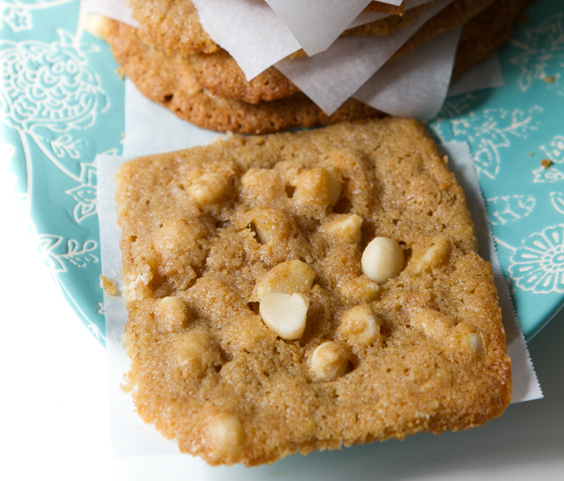 These cream and caramel colored, chewy-on-the-inside, crisp-edges-on-the-outside, Vegan White Chocolate Macadamia Nut Cookies have cast a tropical cookie spell on me. 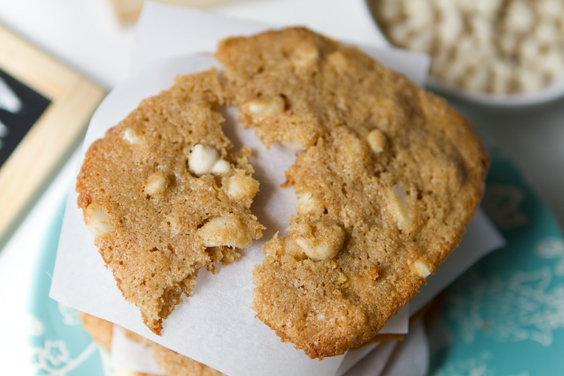 My long lost craving for white choco-mac cookies has been re-inspired with each bite. Sandy shores. Coconut-kissed breezes. I'm swept away. 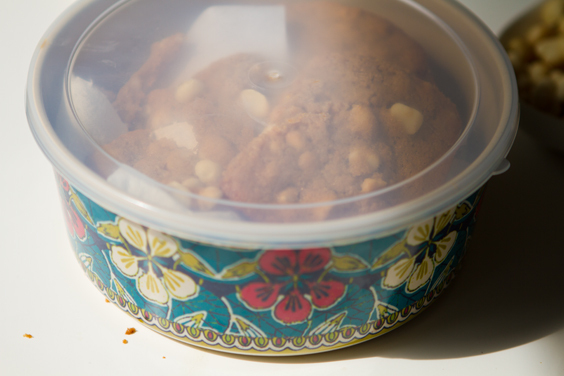 Cookie Swoon. 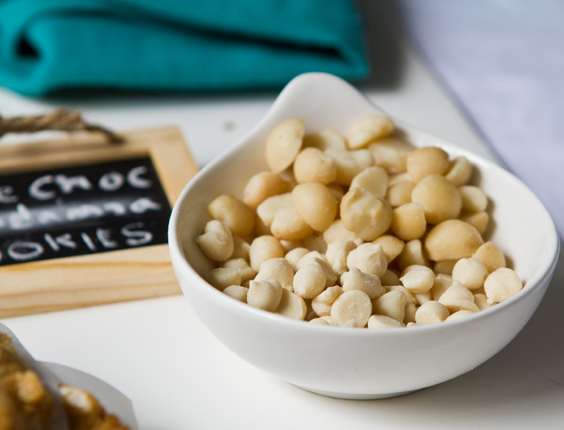 Each bubbly little crevice is stuffed with crunchy, buttery raw macadamia nut bits and velvety white chips. An aroma of cinnamon, vanilla and ginger lingers. 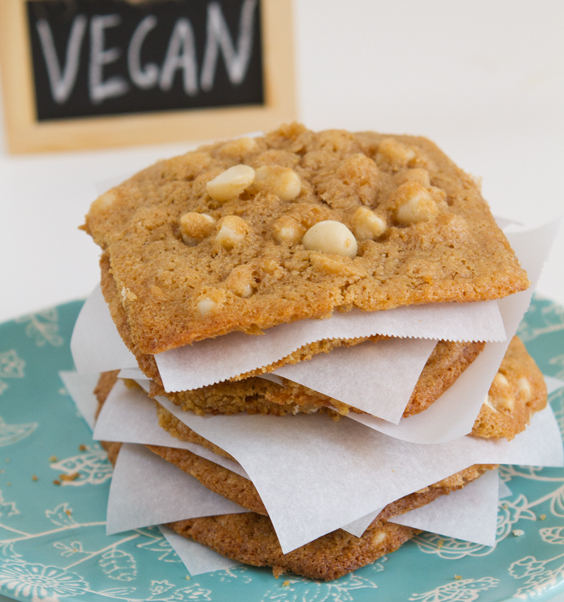 This classic cookie (one of my all-time faves) is now a vegan dessert treat! 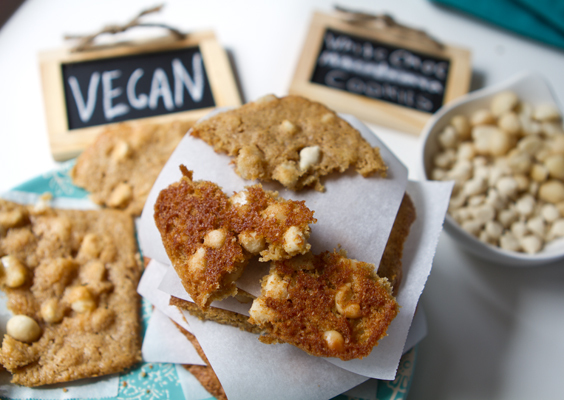 One problem.. this recipe calls for a rare, mysterious, treasure chest item: vegan white chocolate chips! But don't worry - even if you are chipless, you can still make these cookies and drift away to your own dessert island..
Special Order Chips. 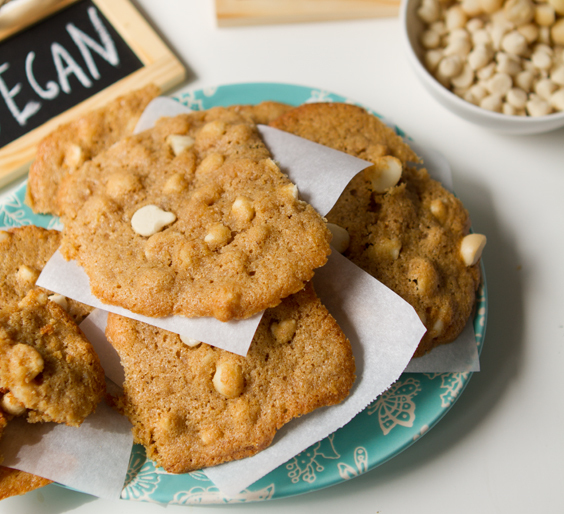 Last week my *vegan* Oppenheimer Kosher white chocolate chips came in the mail. I ordered them online since I have never seen them in stores. 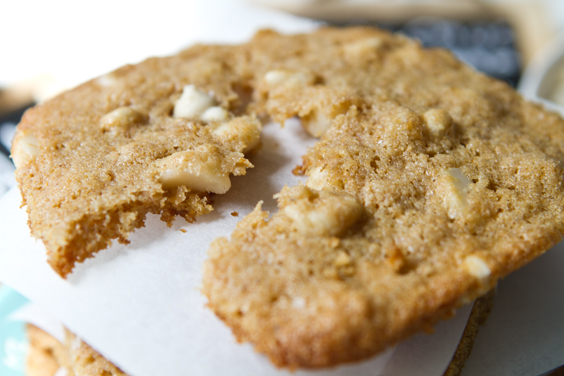 Yup, I guess you could say that this recipe is just a big fat cookie-bliss tease. Unless.. 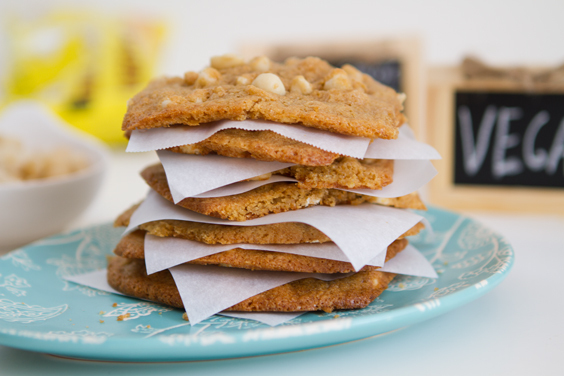 Unless you adore White Chocolate Macadamia Nut Cookies as much as I do, and you want to buy them online, which means forking over the outrageous $15+ shipping to send yourself 3 bags of chips in the mail. Around $14 for the 3 bags (you can't just buy one) - plus $15 .. about $30 total. Investment ingredient. But once I heard about these chips, I had to try them. UPDATE: A few readers have told me that these chips *may* be available in select kosher supermarkets in the US. If anyone finds them, let me know! I will be investigating this myself! 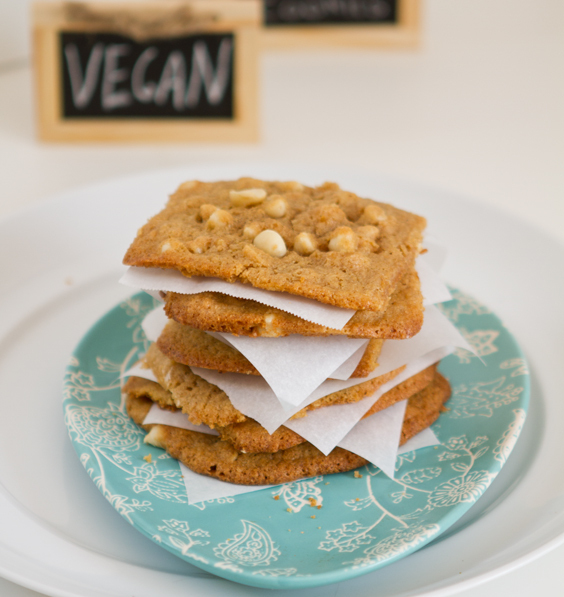 White Chocolate Chips - Vegan! So yes, these chips are REALLY vegan. I was skeptical until I had the package in my hand, but indeed the ingredients are animal product free. The chips are super creamy and luscious. 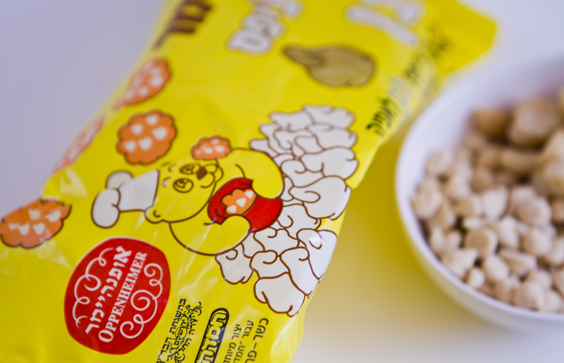 I don't know why more vegan confection companies don't produce vegan white chocolate chips. And vegan peanut butter chips for that matter. Right? White Chocolate. Is white chocolate like so 80's or 90's? Maybe. Upon nibbling these chips, I did actually have a flashback of eating white chocolate CRUNCH candy bars as a kid. Do you remember those?? Maybe I will have to create a vegan version candy bar. Chipless. Otherwise, you can easily substitute white chips with chocolate ones. 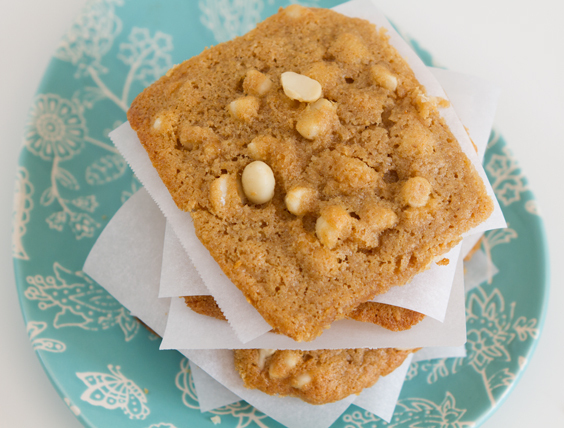 Or even better, really, just add in more chopped macadamia nuts - and maybe a hefty sprinkle of coconut shreds tossed in the dough too. Nuts. 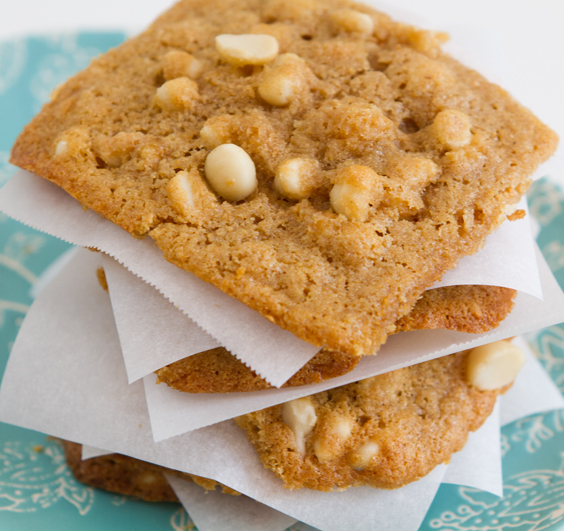 The macadamia nuts are very important to this recipe. I specifically used RAW chopped bits instead of large whole nuts or salted/roasted nuts. 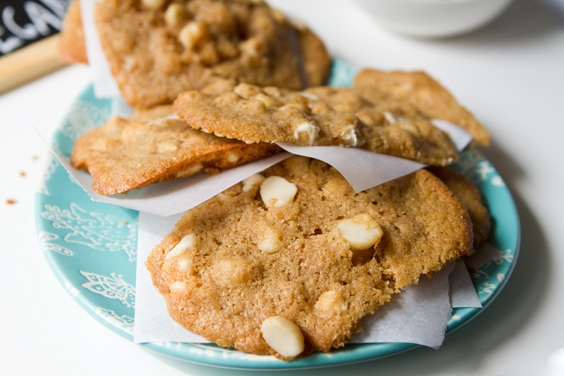 The slted nuts would just be too overpowering to the delicate creamy sweentess of white chocolate. Egg Replacer. I used some vital wheat gluten and a banana as my "egg replacer." The banana adds some fiber and body - white the VWG helps to bind the cookies a bit. However, you can use your own fave replacer - a "flax egg" would work too - or some Ener-G Egg Replacer. 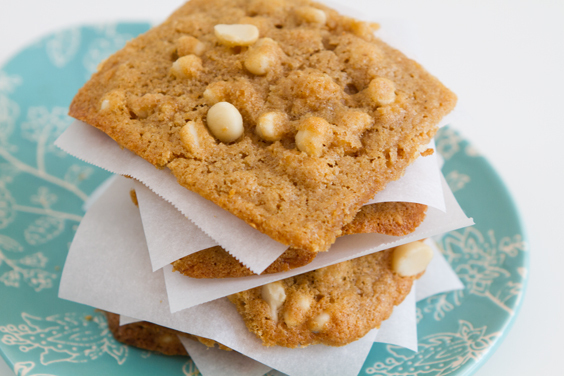 Healthier Cookies. 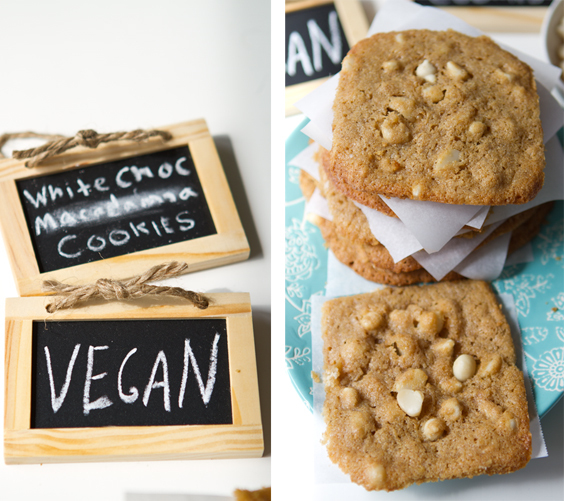 I used two, yes two, sticks of Earth Balance for this dreamy recipe yielding about two dozen cookies. An indulgence simply because I had to go ALL IN for these cookies. But you could easily knock out a hefty portion of vegan butter and add in more mashed banana and a splash of soy milk. Or if you'd prefer, experiment with using extra virgin coconut oil instead of vegan butter. I even love the browned, buttery backside of these caramel-colored cookies.. 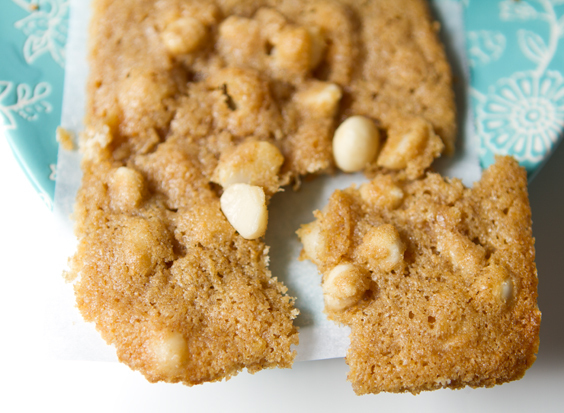 So dive into bliss - and cozy up to a cookie that will simply make you feel peppered with an avalanche of white chocolate warm fuzzies. 2. dd sugar blend ingredients to large bowl. Blend with hand mixer until butter is creamy - a little chunky is still OK.
3. Add in the dry ingredients and mixer blend on lowest setting just until the mixture gets thick. Then remove mixer beaters and hand fold/stor the rest of the dough together. 4. Fold in the chips and nuts. Add more if you want - I added in another handful of those lovely macadamia nuts. 5. You can either spoon warm dough onto parchment paper lined baking sheets - or place dough in fridge for at least 30 minutes for easier scooping of dough. Either way works. 6. Bake cookies at 350 degrees for about 16 minutes. Cool. Enjoy! Aloha storage container, how fitting..